Construction's underway to make several improvements to the Golden Gate Bridge in preparation for its 75th anniversary celebration. The Golden Gate Bridge has been repping the San Francisco Bay Area on postcards, t-shirts and corporate logos for nigh-on 74 years -- and 2012's 75th anniversary is going to mean even more. The Golden Gate Bridge will be the center of attention at a sprawling waterfront festival and spectacular fireworks display over Memorial Day weekend. The Golden Gate Bridge will cap off its 75th anniversary festivities with a two-day party along the San Francisco waterfront during the Memorial Day weekend in May. Visitors to the Golden Gate Bridge, now greeted by little more than a chunk of old suspension cable, a statue of bridge promoter Joseph Strauss, a gift shop and a snack bar, will get a grander welcome starting next year - in time for the bridge's 75th anniversary. Golden Gate Bridge officials have decided to work with the Golden Gate National Parks Conservancy to put on a 75th birthday party for the iconic bridge. The Golden Gate Bridge will be feted in May over two days as part of its 75th birthday bash, officials announced Monday. The city on Monday launched a yearlong 75th anniversary celebration of the opening of the iconic Golden Gate Bridge with a string of parties, guided tours and festivals to be held along the waterfront graced by the burnt-orange span since 1937. 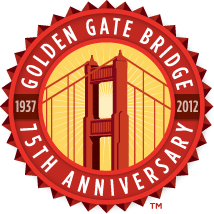 Organizers of the 75th anniversary of the Golden Gate Bridge hope that the celebration won't be nearly as successful as the 50th. With the 75th anniversary of the Golden Gate Bridge a little more than a year away, the bridge district joined forces with the Golden Gate National Parks Conservancy and the National Park Service on Friday to plan not only a birthday bash but also a more welcoming environment for visitors. The Golden Gate Bridge celebrates its 75th anniversary.